SIX persons died while 12 others were injured in two recent separate encounters between the military and New People’s Army (NPA) in San Luis in Agusan del Sur, a statement from the New People's Army claimed Friday. Allan Juanito, spokesman of the NPA’ North Central Mindanao Regional Command, said the casualties and wounded belong the military’s 26th Infantry Battalion based in San Luis. “The NPA suffered no casualties,” he added. But in a text message sent to this paper Friday afternoon, Captain Christian Uy, spokesman of the Philippine Army’s 4th Infantry Division, denied the NPA's claim and said only seven law enforcers were wounded. “Nine were wounded in the troops: seven enlisted military personnel, one police officer, and a member of the Civilian Armed Forces Geographical Unit (CAFGU) Active Auxiliary (CAA),” Uy said. The Somo, Juanito said, is supposed to end January 15. 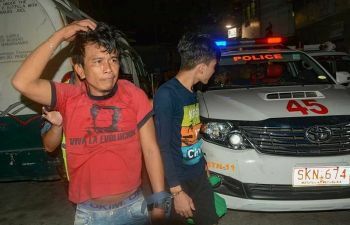 Uy said the arresting team was on its way back to the 26IB camp after serving the warrant of arrest of a certain Nelson Lugpatan Campos for murder at sitio Kipuyag, barangay San Pedro, in San Luis, when they were fired upon by the guerrillas. The Maoist fighters accused the military for violating the temporary ceasefire. Juanito said the military operations continue in San Luis, Agusan del Sur; San Fernando and Impasug-ong in Bukidnon; and Gingoog, Claveria and Binuangan in Misamis Oriental. The NPA, the military wing of the Communist Party of the Philippines (CPP), accused the 26IB for lying. The guerillas said for a week the military scoured the forested and interior areas hunting the NPA down. “And their search turned out to be for nothing,” Juanito said. Juanito added the NPA fighters pursued the troops instead as they headed back to their base. “On January 8, around 11:35 AM, an NPA team harassed a column of the 26IB climbing a steep bank in Mahaba River, going toward Km. 27, Side 2, barangay Mahayahay, San Luis. Five were wounded among the troops, including their guide, a certain ‘Biane,’ a CAFGU member allegedly known for his extortion activities on small-scale loggers in San Luis.